In this edition of our continuing Not A Word About Hockey series we’re going to talk to Omsk junior hockey alumnus Dmitry Salvasser. 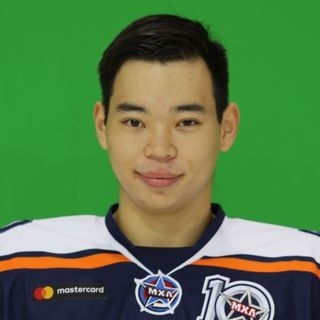 Last season the 19-year-old forward played for as many as three teams – Omskie Yastreby, Sarmaty Orenburg and Yuzhny Ural-Metallurg. Although, that’s enough about hockey. - I decide on what I eat myself. I always have a big breakfast, which usually consists of cereal with milk, curd, scrambled eggs and sandwich with coffee. For lunch I try to eat more complex carbohydrates. I begin my dinner with a salad and main course. Typically, it’s chicken pasta. A few hours before I go to bed, I have a little snack. My favourite meal is barbecue starlet. Sports mix aside, I take in about 9,000 calories per day with 15 liters of liquid, including practices. - I have a pet at home. It’s a small goldfinch. His name is Gosha. He lives in a small cage and sings beautifully in the morning. - I love to spend time in company of my good friends. It doesn’t matter what we do – either we go to the country, country house or just stroll down an unknown street in town. I enjoy reading interesting books and watching exciting movies. I have fun swimming in the pool, or in the river, where I can switch off from everyday rush and just swim for fun. Swimming is very good for your body. It helps you recover from injuries and hard work-outs. - I would like to go to France and Spain. I want to know more about the culture, history and sights of these countries, while actually being there. - Right now I’m in Orenburg. I have friends on the team. In our spare time we like to go to cafes, movies, restaurants, quests or go-carting. We like to go to other sports, too, like volleyball and basketball. - My father taught me to listen to all kinds of music and watch all kinds of movies when I was a kid. Most memorable movies for me were the entire Taxi series, Fast and Furious and Avengers. My favorite actors are Jason Statham, Dwayne Johnson, Silvestre Stallone, Jackie Chan and Jean-Claude Van Damm. - I like absolutely all kinds of music – from hard rock to blues. I also enjoy listening to hip-hop, rap and club music. The latest track I added to my playlist was Dama by Miyagi Endspiel. They’re about to release a new album. I follow music trends and try to keep up with it. - I’m active, communicative, independent and sincere. My biggest shortcoming is quick temper. - It rarely happens that I don’t want to get up in the morning to go to practice, only when I didn’t have enough sleep. I motivate myself that if I miss a practice then instead of taking a step forward, I would take two steps back. - I play every game as if it was my first and last. I’m full of energy and positivity before the games. - My father has always been a role model to me. I have looked up to him ever since I was a kid. A real man must be honorable, generous, goal-driven, sensitive, attentive, honest, loyal, clever, kind, composed, caring, independent and have good manners. - I inherited my character from my father but I do look like my mother. My mom has always been in charge of my education, while my father has taken care of my athletics and manners. I also inherited sincerity and kindness from my mother. My grandfathers and grandmothers, whom I love very much, also took part part in my upbringing. I really enjoy spending time with them and I’m very grateful to my whole family for all their care. - I’m superstitious but selective. I believe I am a bit of a gambler because you need that in hockey. You shouldn’t play hockey unless you really want to win. - I don’t have a role model when it comes to men’s attire. I take examples from celebrities. I try to take away their positive characteristics but that’s about it. I don’t copy anybody. - I don’t think you should pay attention to clothing brands and put any focus on it because you may like anything. It would be silly not to get it just because it’s not a certain top brand. Black, red and white are dominant colors in my wardrobe. - My favorite perfume is Paco Rabanne by Dior. - I don’t think that any relationship would be an obstacle in hockey career. My ideal girlfriend has to be smart, attentive, caring, beautiful, spiritually developed and make home a comfortable place. - If I’m going to have a son, first thing I’m going to do is ask him whether or not he wants to play hockey. I will take him to a few practices and see how it goes. If he doesn’t want to play the sport, there is no way he’s going to succeed at it. If I’m going to have a daughter, I will most likely sign her up for dancing, gymnastics or aerobics. - If it weren’t for hockey, I would have dedicated my entire childhood, adolescence and teenage years to science. After that I would enter adulthood with a great deal of knowledge. - I study at Omsk Law College. I’m majoring in law enforcement. I just finished my third year. I rarely get the chance to go to classes but I know my classmates and a few other guys at college. I try to stay in touch with them. I have become good friends with many of them. - Getting a good education is just as important to me as playing hockey. You can’t make it far without a higher education in our days. I’m going to get a second degree as well. I believe, sky is the limit to perfection. - Not a lot of people know this, but I actually have a hard time dealing with heat. Sometimes at pre-season camps I sleep on the roof of Zvyozdny Ice Palace because of the weather because I can’t sleep if it’s too hot.